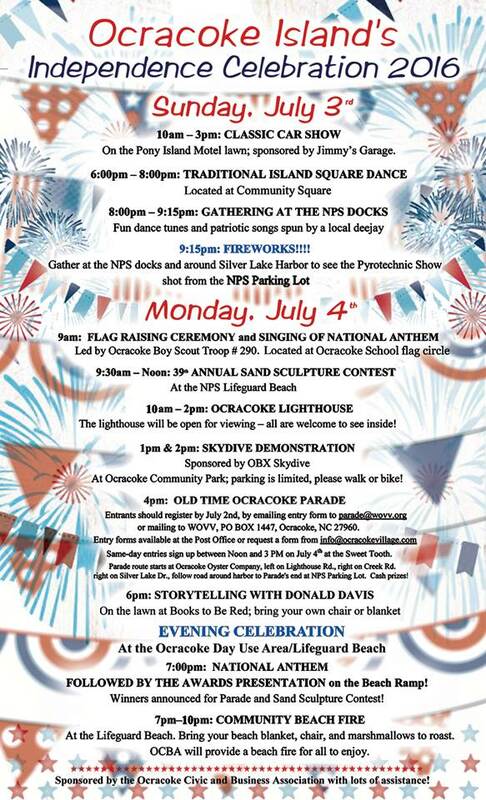 For the first time since the deadly explosion of 2009 Ocracoke Village will again host an Independence Day fireworks display. It will begin at 9:15 pm on Saturday, July 3. 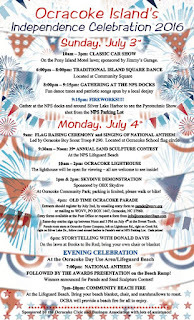 Click on the image above (follow directions on the right to view a larger image) for more information about fireworks, storytelling, music, square dance, sand sculpture contest, sky diving demonstration, beach fire, parade, and more. The NPS parking lot and boat ramp will close at 5pm on Saturday, July 2nd. The parking lot should re-open on Monday, July 4th. Bill Gilbert has offered to let boaters use the boat ramp at the Anchorage Inn while the parking lot is closed. Please contact the Anchorage Marina at 928-6661. 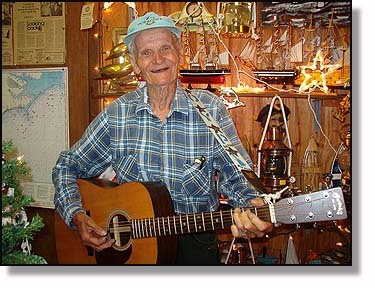 Tommy Hutcherson will be playing tunes at the NPS docks next to the ferries starting at 8pm, July 3rd. Bring a chair or blanket and claim a space on the docks or grassy area for the best view of the fireworks. The Community Center parking lot will be available for visitors after 7pm on July 3rd. The Community Square parking lot will be available after 8pm. Please walk, bike, or if you must, use a golf cart. We expect a big crowd. And, if you haven't already done so, take at look at this month's Ocracoke Newsletter. It is an article about the 1953 July 4th Parade, and it is accompanied by vintage photos.You can read the Newsletter here: http://www.villagecraftsmen.com/news062116.htm. The 19th century was the Great Age of Sail, and the Outer Banks played a major role in maritime traffic of the era. According to a History of Portsmouth Village (https://www.nps.gov/calo/planyourvisit/upload/Portsmouth2007.pdf) "in 1842, over 1,400 vessels and two-thirds of the exports of the state passed through Ocracoke Inlet." Charles T. Williams, II (born prior to the turn of the twentieth century), in this book, The Kinnakeeter, describes the Kinnakeet Atlantic Anchorage Basin, just north of Cape Hatteras as "a peaceful and restless anchorage for the sailing ships of all nations." 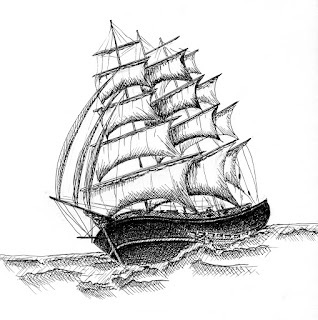 He writes, "I remember when I was a boy the wind during one summer blew from the southwest forty days, and during that forty days two- or three-hundred sailing vessels, barks, barkentines, fully rigged square-riggers, two-, three-, and four-masted shooners of all description were anchored in the Kinnakeet Anchorage Basin. "People that never saw the anchorage filled with ships can only have an artist's conception of what it looked like. 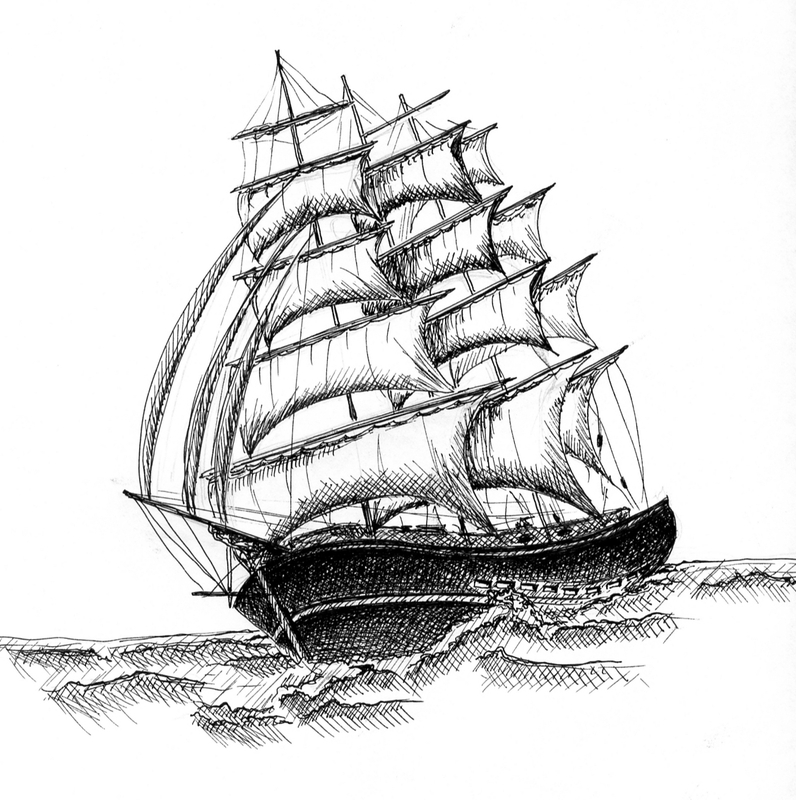 During the night a brisk shift of wind to the northwest [blew up], and in the early morning the ships, with all sails spread, sailing in a southeast direction, were a beauty to stir one's memory forever." 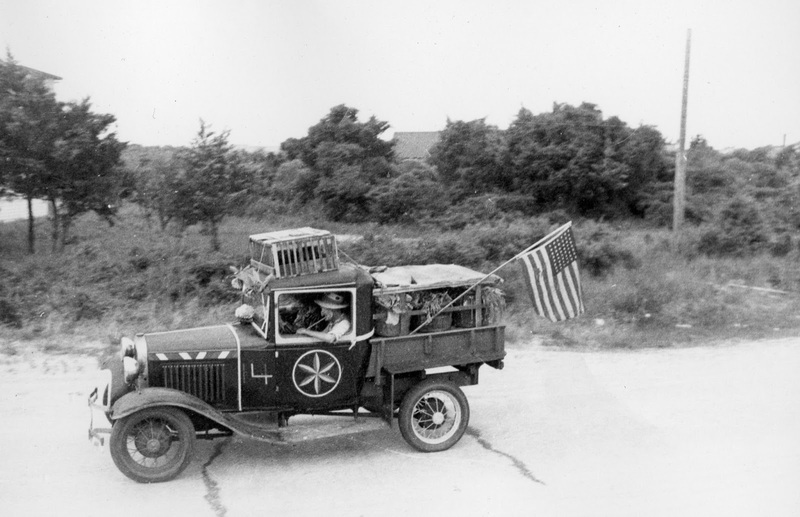 This month's Ocracoke Newsletter is an article about one of the early July 4th Parades written by Alice Rondthaler in 1953. It is accompanied by vintage photos.You can read the Newsletter here: http://www.villagecraftsmen.com/news062116.htm. I am always delighted to see wildlife finding ways to survive in the midst of human development. 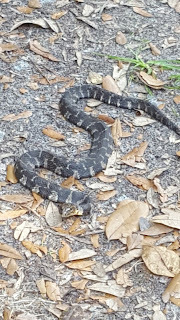 Not long ago I encountered this reptile lying placidly in my driveway. 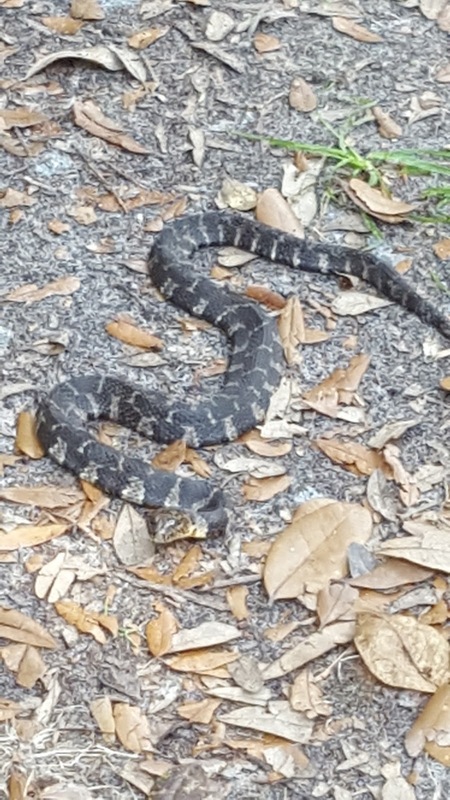 I think this is a Carolina Water Snake, a subspecies of the nonvenomous Northern Water Snake. I stopped to look and take this photo. The snake lay still and quiet for several minutes, just looking at me. Then it slithered away and disappeared under a pile of leaves and branches. As most of our readers know, Ocracoke does not have a hospital. However, we do have a small clinic, a dedicated resident doctor, and well-trained professional EMTs (Emergency Medical Technicians). In cases of serious accident or illness, medical helicopters from Greenville, NC, or Norfolk, VA, can transport patients to a hospital. 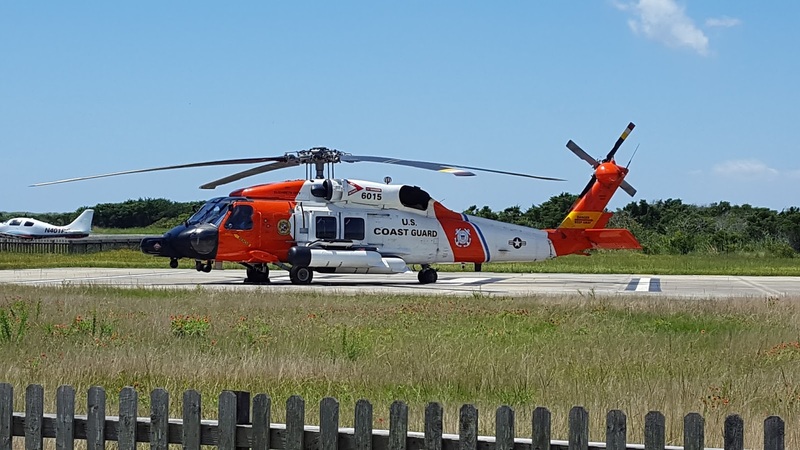 The United States Coast Guard Air Station in Elizabeth City, NC, also has a Sikorsky MH-60T Jayhawk helicopter, an all weather, medium-range vehicle specialized for search and recovery. 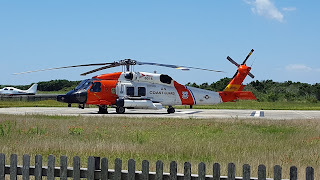 Several days ago the MH-60 made a non-emergency landing at Ocracoke and I was able to make this photo. Ocracokers have always been grateful for the role the Coast Guard has played in the life of this small isolated commutity. 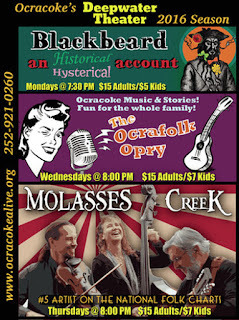 Ocracoke Alive’s Deepwater Theater and Music Hall is the island headquarters for Ocracoke Alive, as well as the home venue for summertime shows for Ocracoke's internationally renowned folk band, Molasses Creek (Thursdays), the Ocrafolk Opry (Wednesdays), and Blackbeard: An (Historical/Hysterical) Account (Mondays). If you'd like to experience a uniquely Outer Banks thing to do June through September, be in these audiences! Detailed schedules and information about other special events are posted online, at the entrance to the theater and around the village. Show times vary between 7:30 and 8:00 PM, so check the online schedule for details. Ticket prices are around $15 for adults and $5-7 for children, and a weekly pass is available. Credit cards are accepted. Advance reservations recommended through the website or by calling 252-921-0260. New this year is "Blackbeard, an Historical/Hysterical Account." The performance is filled with facts about Blackbeard and his demise at Ocracoke in 1718, and at the same time thoroughly entertaining fun for the entire family. In addition to a principal "keeper," lighthouses often required first and second assistants. One might wonder why a lighthouse needed so many attendants, but maintaining a lighthouse was a major job. The keeper was responsible for lighting the lamp at sunset, ensuring that it remained lit throughout the night, and extinguishing it at sunrise. The lamp needed to be filled with fuel daily, and the wick trimmed regularly. The Fresnel lens and lantern room windows had to be cleaned and polished every morning. Keepers were required to shine and polish all of the brass, sweep the floors and stairs, and clean tower windows and sills as needed. They also cleaned, painted, and repaired all of the buildings, including the keeper's dwelling, chimneys, privies, outbuildings, and the tower itself. In addition, keepers were required to maintain all mechanical equipment, weed walkways, paint and maintain the fence, and see that the grounds were presentable. They kept a log book, recorded weather readings, and kept an inventory of all equipment. Keepers were forbidden to leave the light station without permission, and were considered to be on duty 24 hours a day, 7 days a week. They even provided visitors with tours of the lighthouse as needed. And, as Cheryl Shelton-Roberts & Bruce Roberts point out in their book, Lighthouse Families, "One of the biggest jobs in maintaining a lighthouse [was] painting the tower...." In the book John Gaskill (1916-2013), son of Vernon Gaskill (1889-1984), principal keeper of the 170' tall Bodie Island Lighthouse (by comparison, the Ocracoke Lighthouse is 75' tall), relates climbing into a "paintbox" attached to the lighthouse's catwalk by hooks and ropes. The painters worked their way down, scraping and painting (white and black paint mixed with zinc, lead, linseed oil, and turpentine). It "took as much courage as they could muster." It was not a job for the faint of heart! *Jarek Tuszynski / CC-BY-SA-3.0 & GDFL [CC BY-SA 3.0 (http://creativecommons.org/licenses/by-sa/3.0) or GFDL (http://www.gnu.org/copyleft/fdl.html)], via Wikimedia Common. The number of inlets, and their changing locations, attest to the dynamic nature of these fragile barrier islands. In recognition of Ocracoke's upcoming Independence Day Celebration, our current Ocracoke Newsletter is a 1953 article written by Alice Rondthaler about one of the island's early July 4th Parades. A number of vintage photographs from the Mary Ruth Dickson Collection at the Ocracoke Preservation Society and from the Chip Stevens Collection accompany the article. You can read the Newsletter here: http://www.villagecraftsmen.com/news062116.htm. In 1912 the Bureau of Lighthouses reported to Congress: "To promote efficiency and friendly rivalry among lighthouse keepers, a system of efficiency stars and pennants has been established. Keepers who have been commended for efficiency at each quarterly inspection during the year are entitled to wear the inspector's star for the next year, and those who receive the inspector's star for three successive years will be entitled to wear the Commissioner's star..."
On August 18, 1914, Capt. Leon Wesley Austin, Keeper of the Ocracoke Lighthouse, received this notice: "You are informed that you have been awarded an efficiency star. 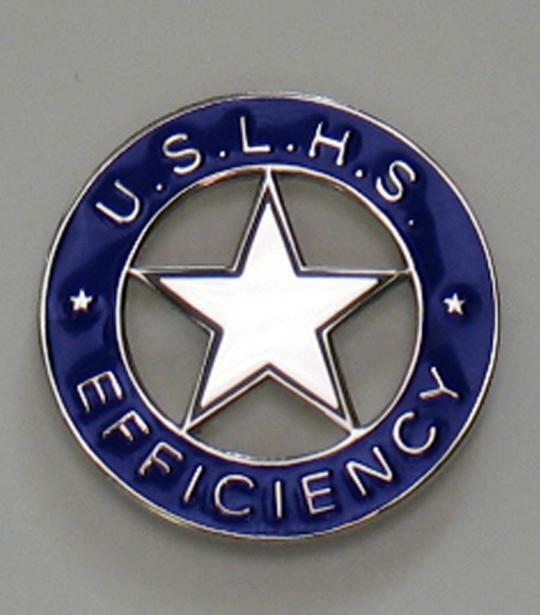 You are therefore entitled to wear the efficiency star for the succeeding fiscal year beginning July 1st, 1914. [It] shall be worn in a manor described in the uniform manual." 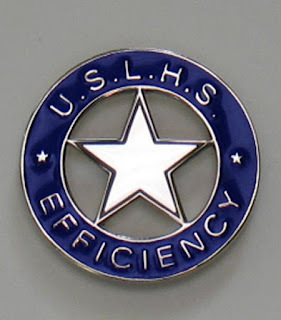 For $6.50 you can order your very own Efficiency Star from the United States Lighthouse Society. 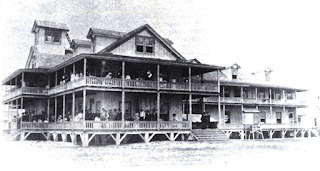 This month's Ocracoke Newsletter is the dramatic story of life-saver Rasmus Midgett and his rescue of the crew of the barkentine Priscilla in August, 1899. You can read it here: http://www.villagecraftsmen.com/news052116.htm. 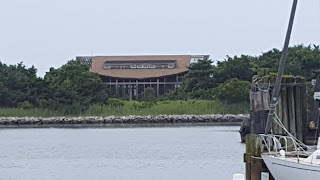 In a recent blog a reader left this comment: "We first stayed on Ocracoke in 1973 and way back then it seems we noticed a fairly large house with sloped roof almost directly opposite the C. Guard station - on the other side of the channel into the lake. Do you know who built it? Or who lived in it? A long time ago we were told that it was where the mystery writer Mary Ellen Bradford ?? stayed from time to time. We tried to find a Mary Ellen Bradford but it was a dead end. Can you shed any light on any of this?" I believe the reader is referring to the home of Leonard (1916-2014) and Beverly Meeker, wonderful people who have contributed much to the Ocracoke community. If I remember correctly, the house was built sometime in the 1980s. Leonard was a remarkable man whose life included a distinguished public service career in government and work with non-profit organizations focusing on social justice law. It was always a delight to visit with Leonard and Beverly, either joining other island friends for dinner around their dining room table, or sipping Woodford Reserve Kentucky Straight Bourbon Whiskey and discussing local and world affairs on their screened porch overlooking Pamlico Sound. I am not familiar with Mary Ellen Bradford. If she ever visited Ocracoke I am not aware of it. Leonard died at the age of 98 in his home in 2014. 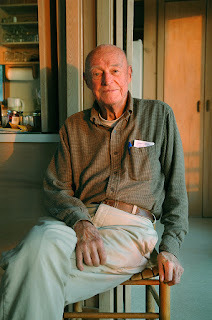 Peter Vankevich wrote a detailed obituary in the Ocracoke Observer: https://ocracokeobserver.com/2014/12/05/leonard-meeker-1916-2014-2/. Beverly continues to live in the home. Ocracoke's Eighth Annual Women's Arm Wrestling Tournament will be held tonight at 6:30 in the Community Center (not in the back yard of the Village Thrift Store, as originally planned). This is a fun evening's entertainment with friendly competition and creative costumes. 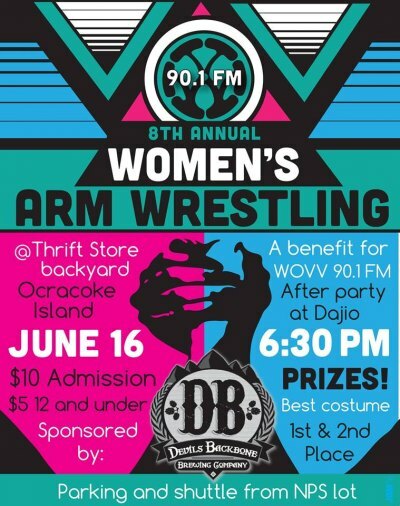 The event is a benefit for Ocracoke's radio station, WOVV (90.1 FM). Come on out for a great time! 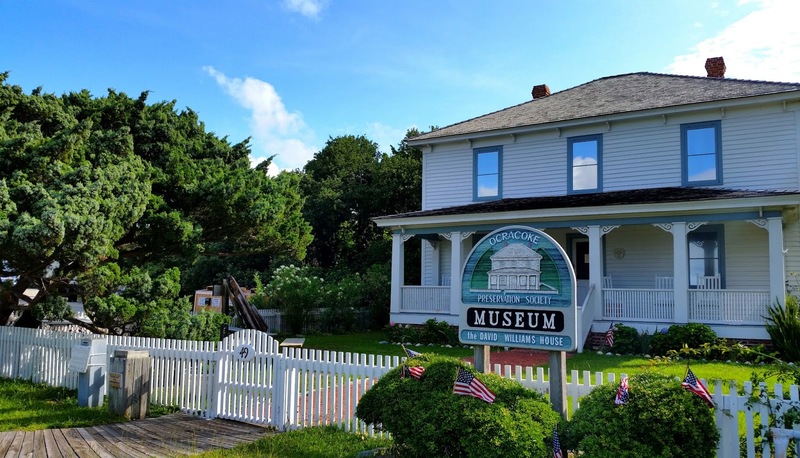 The Ocracoke Preservation Society hosts a number of informative and fun summertime events at the museum. These include museum tours, porch talks (history, wildlife, environmental issues, seafaring, pirates, storytelling, etc. ), and kids' programs. The OPS Museum is located near the Swan Quarter/Cedar Island ferry docks, across the parking lot from the National Park Service Visitors Center. Many an Ocracoke Island home was built from lumber salvaged from wrecked sailing ships. 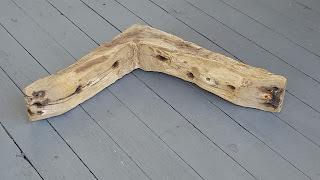 One highly prized item was the ship’s “knee,” a sturdy right-angle timber hand hewn from the Hackmatack tree which grows in Canada and the northeastern United States. Because the root of the Hackmatack tree grows at a right angle to the trunk, this section of the tree has great strength. Called "tension wood," it was widely used to make "knees," which have a long history of use by builders of wooden ships, to join ribs to deck timbers. Salvaged ship's knees were often re-purposed to be used in island houses to secure floor joists to the outer beams. 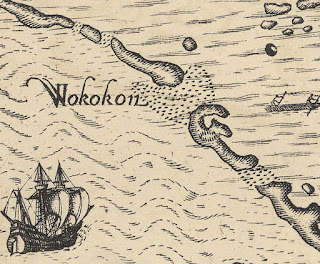 The earliest known spellings of Ocracoke ("Wococon" and "Wokokon") are found on 1585 maps drawn by John White, who was among those who sailed from England to America as a member of Sir Walter Raleigh's expeditions. Roger Payne, in his book, Place Names of the Outer Banks, speculates that Wococon could be a tortured Anglicization of the Algonquian word "waxihikami" which means "enclosed place, fort, or stockade." (See our post on June 10, 2016). Historian David Stick has a different explanation. 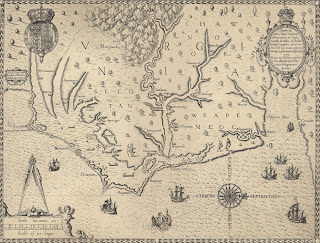 When Walter Raleigh's expedition set foot on Ocracoke in 1584, the explorers reportedly asked the natives they encountered what the name of their country was. In reply the Indians answered "Wingandacon," which Stick believes became "Wococon." In truth, the actual reply was "You wear good clothes." Over the years I knew I had seen a dozen or more different spellings for the present-day Ocracoke Island. Curious, in 2003 I decided to compile a list of all the variations I could document. Ultimately I discovered more than fifty distinct names and/or spellings for Ocracoke. The following chart lists eighteen different spellings (highlighted in yellow), as well as a number of duplicates, from a series of early maps and other documents. The earliest record of the current "Ocracoke" that I could find was on a map dated 1852. In addition to the spellings listed above, I located the following 34 variations mentioned in different books and pamphlets, although no sources were indicated. These do not include other names by which Ocracoke was sometimes known, such as Pilot Town, Port Bath, Port Grenvil, and Gordons Ile. One of the more enduring early spellings was "Occacock." On July 4, 1584, two English barks under the command of Philip Amadas and Arthur Barlowe began their exploration of the "New World." They had been sent by Sir Walter Raleigh to locate a suitable site to establish an English colony on the American coast. More expeditions were to follow. 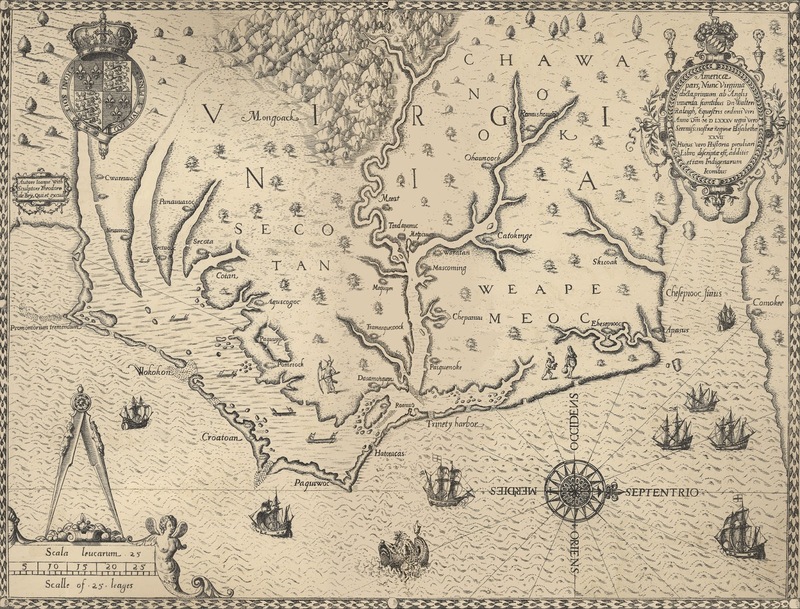 In 1590 Thomas Hariot published A Briefe and True Report of the New Found Land of Virginia. This volume included an engraving (below) by Theodor de Bry based on watercolor illustrations made by Capt. John White, commander of the 1587 expedition sent by Raleigh. It shows the Outer Banks of North Carolina. Please enlarge the map to view a better image. 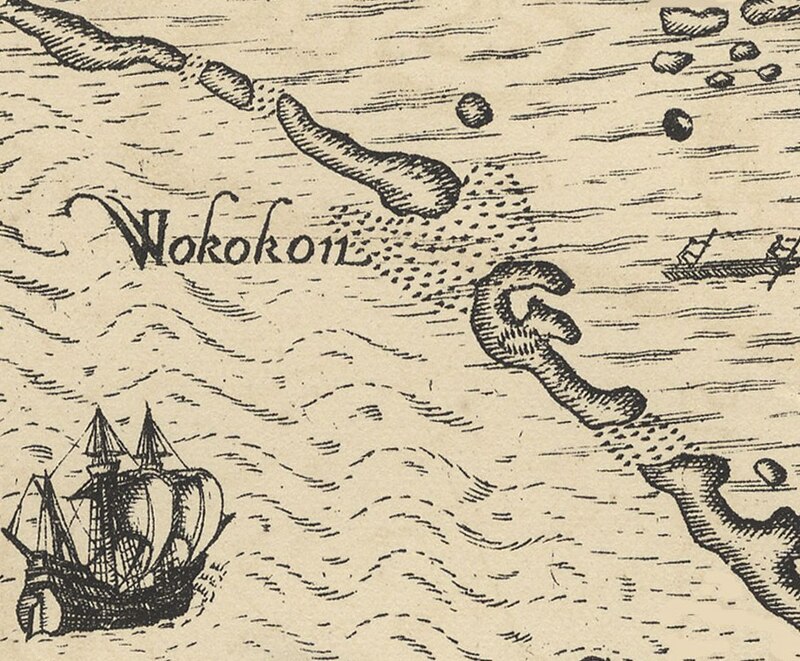 This 1590 map is oriented with North (Septentrio) to the right, and shows Wokokon (Ocracoke) just above the sailing ship on the left. "Wokokon: 1. 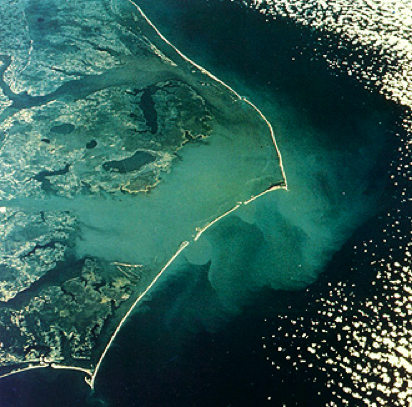 An inlet near, or identical with, present-day Ocracoke Inlet. 2. An Island, which Arthur Barlowe called 'an out Island vninhabited,' probably consisting of the southern half of modern Ocracoke Island. The etymology of Wokokon (perhaps from Proto-Algonquian waxkahikani, 'stockade' or 'stronghold') and the palisade symbol northeast of the inlet may indicate a palisaded town abandoned before English contact. De Bry used this symbol with some lack of restraint to indicate towns without palisades, such as Pomeiock (which see), and perhaps other things; so it is far from certain what the symbol signifies here." There are more than 80 family cemeteries scattered around Ocracoke village. But there is only one island grave marker made by The Monumental Bronze Company. It is the marker for Tilmon (1798-1880) & Anna (1804-1884) Farrow. And after more than a century and a quarter it is still as legible as the day it was installed. The Farrows' “White Bronze” grave marker is actually made from zinc. The fancy "white bronze" name was a marketing ploy to make the zinc material sound more attractive. The markers, which were sold nationwide from the 1870s to 1912, came from the The Monumental Bronze Company of Bridgeport, Connecticut. The colors of these markers can be pale grey to a very pale baby blue. They are hollow, and mainland stories have been told of how gardeners hid garden tools inside, and how outlaws hid their loot in them. The Farrows' zinc marker has stood the test of time better than their neighboring contemporary stone markers which are often eaten away by weather, lichens and mosses. If you will be on the island this coming Sunday, June 12 you are invited to join Janie Meneely & Rob van Sante at Coyote Music Den from 8–10 p.m. They will be presenting an evening of maritime music they call "The Bay and Beyond." Admission is $15 per person. 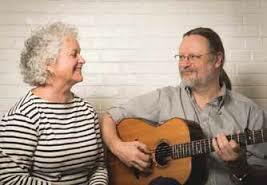 Described as “The Voice of the Chesapeake” singer/songwriter Janie Meneely joins forces with Dutch-born guitarist/balladeer Rob van Sante for a lively evening of maritime music derived from the Old World and the New. Meneely brings the characters and history of the Chesapeake Bay watermen to life with witty and sometimes poignant clarity. Van Sante, who has toured extensively with the likes of Alan Reid (Battlefield Band), Kate Rusby, John Connolly and other folk luminaries, adds his own take on traditional music while backing Janie up on guitar and vocals. 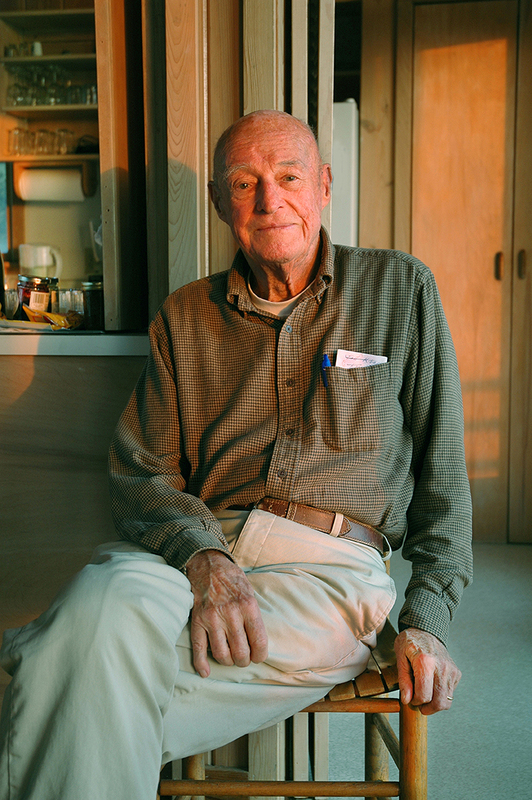 Many of our readers will remember island native Roy Parsons (1921-2007). He was a regular performer at the Ocracoke Opry. "Roy played three songs on guitar and harmonica, and I had the impression that, had the other musicians not joined him onstage, he would have played a few more. The pace of the songs waxed and waned, but there was no doubt that Roy still possessed plenty of wind. After the third song he remained sitting on his stool. "There was a long silence. "Gary Mitchell knelt beside him. "'I had some turkey, and lots of pie and collards,' stated Roy. "'I didn't get any collards,' said Gary amiably. "'Well, you should have come around, I'd have given you some.' Roy returned to sitting ramrod straight and silent. "There was another pregnant pause. I could imagine Roy at home, spending the day neatly laying out his clothes, gathering his guitar and harmonica, considering and reconsidering his song list, waiting patiently in a favorite chair until evening purpled, then darkened, his windows. "In our youth-obsessed culture the old rarely take the stage anymore, except to extol the virtues of various laxatives or the positive assets of denture cream. These are not positions of respect. "Nobody rushed Roy, or filled the silence with a joke at his expense. The audience waited patiently. "'Do you have any Thanksgiving memories from long ago, Roy" Gary finally asked. "Roy considered this for only a moment. 'No,' he said flatly." Anyone who remembers Roy's performances at the Opry can picture the scene above. We all miss Roy. Hotel enlarged. Table supplied with the best. Servants attentive and polite. Soda fountain. Band of music. Rates low. Steamer two trips a week from Washington and one from New Berne. First trip June 18th from Washington. I have often wondered how old the Outer Banks is. Recently I decided to read carefully The Battle for North Carolina's Coast by Stanley R. Riggs, Distinguished Research Professor in the Department of Geological Sciences at East Carolina University. Riggs identifies two Coastal Zones in North Carolina. Ocracoke belongs in the Northern Coastal Zone which extends from the Virginia border to Cape Lookout. Unlike the Southern Coastal zone which is "underlain by rocks that range in age from 145 to 2.6 million years," the Northern Coastal Zone is filled with "marine mud, muddy sand, sand, and peat" which buried the older rock "to a depth of 50 to 250 feet." Ca. 9,000 years ago: Sea level rise flooded the paleo-Tar and Neuse River valleys, "forming a series of small narrow estuaries." At this time the mainland ocean shoreline was a few miles east of the present Outer Banks. Riggs speculates that there might have been barrier islands situated close to the shoreline. By ca. 7,000 years ago Pamlico Sound formed as the result of continued sea level rise. Precursor barrier islands formed "east of the modern Outer Banks." What we know today as the Outer Banks did not exist at that time. Over the next few thousand years the shoreline migrated to the west. By ca. 1,100 years ago (ca. 900 CE) barrier islands existed close to the location of the modern Outer Banks. Beginning ca. 1,100 years ago much of the southern section of the Outer Banks, from Cape Hatteras to Ocracoke Inlet, collapsed as the result of storms, creating back-barrier shoals. By about 500 years ago (just prior to the arrival of the first Europeans) the modern Outer Banks barrier islands re-formed. During the "Little Ice Age" (ca. 1300 to ca. 1850) numerous inlets, probably the result of increased storm activity, separated the islands of the Outer Banks. Today, there are only three major inlets along the Outer Banks: Oregon, Hatteras, and Ocracoke. So, the answer to my question, according to Dr. Riggs, is that Ocracoke Island is approximately 500 years old...young by geologic standards. 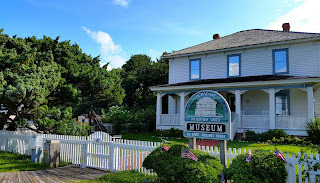 "Since 1918, Ocracoke's Community Square has been the heart of our maritime heritage, a welcoming gathering place for watermen, merchants, students, locals and tourists alike. Nearly a century later, stories are still shared, goods are still sold, and local events are still celebrated amongst these 5 National Register structures and waterfront docks." But the Revitalization Project needs funds to meet their goals. In order to continue to protect the Community Square, an $800,000 interim loan from The Conservation Fund must be repaid by October, 2016. As the Foundation raises the money to repay The Conservation Fund, the private donor is willing to release the debt obligation dollar for dollar. Therefore, between now and October 2016, for all donations made to repay The Conservation Fund loan, the Private Donor will forgive an equal amount—up to $800,000. For more information, and to make a contribution to the Community Square Revitalization Project click here. 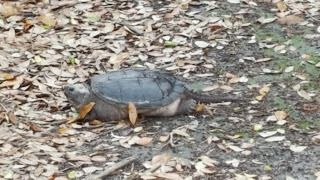 According to Susanne Kynast on the web site Tortoise Trust, "Around mid June [snapping turtle] nesting will start. The females undertake extensive true nesting migrations in search for a preferably sandy, sunny nest site." 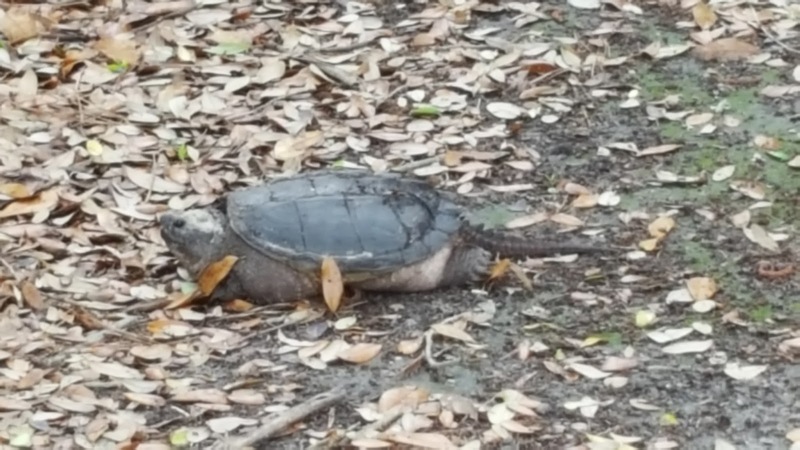 Several snapping turtles have been seen in the village lately. Just a few days ago Lachlan called me over to see a snapper that was slowly making her way across Howard Street.